ON Sunday 20th September pleasant weather favoured a party in the garden of Brinkley Hall Farm to celebrate the golden wedding of Kathleen and John Merryweather. Festivities commenced at mid-day with members of the family and with friends acquired during half a century, assembled in strength to support the occasion. The Army Catering Corps, directed by Quartermaster Barraclough, organised refreshments. Kathleen and John Merryweather met at a Southwell Golf Ball, an annual function in October celebrated in the Assembly Rooms, then a feature of the Saracen's Head Hotel. Southwell Golf Course ceased to exist when Government instructions required the golf course to be ploughed up to provide extra food for hungry Britons during World War II. Before her marriage Kathleen had been employed as a clerk in an office connected with insurance. Her daily journey to Nottingham included a 3-mile walk in all weathers from The Burnell Arms at Winkburn, where her parents were landlords, to Southwell Station. 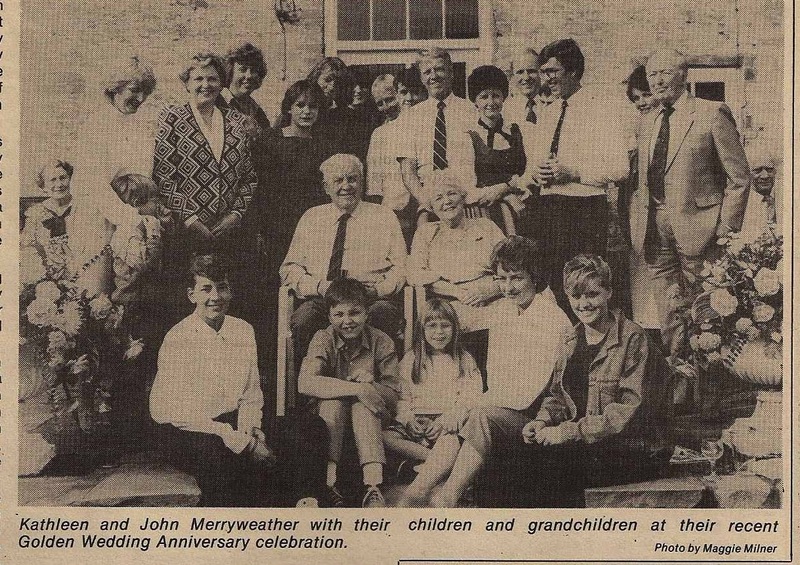 John was a member of H. Merryweather and Sons Ltd, a family horticultural establishment which started business on Halam Road in 1852. The firm is now directed by John's older sons, making them the fifth generation in the business. The wedding, at Southwell Minster, was conducted by the Reverend Noel Turner, who had attended the same school as the groom, Worksop College. After a mere two years of married happiness John was summoned to attend a Territorial Army Exercise, but before the exercise was concluded, 276 Sty RATA were embodied into the regular army. John served in England, North Africa, France, Belgium, Holland and Germany for six years with only a fortnight's leave in total during that period. Pic caption: Kathleen and John Merryweather with their children and grandchildren at their recent Golden Wedding Anniversary celebration.